Comcast has unveiled a revamped “Studio C” — the “C” presumably in honor of the company’s name. 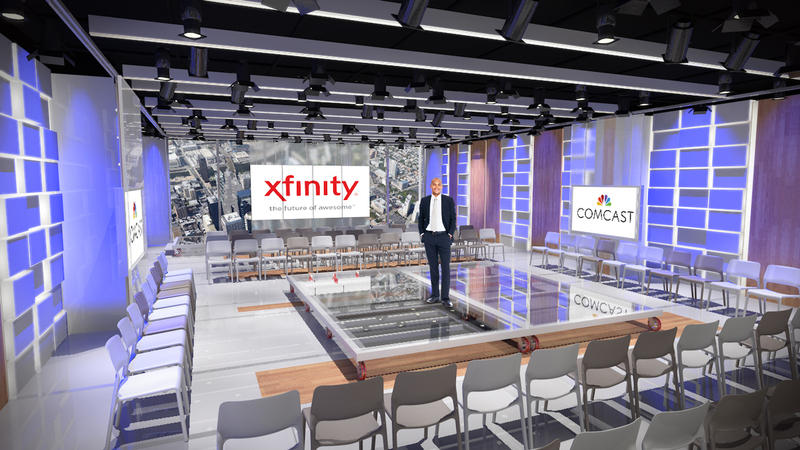 The 2,200-square-foot studio, which is part of Comcast Center in Philadelphia, is designed primarily for producing taped corporate communications for employees and live town halls, notes Bryan Higgason of HD Studio, the set’s designer. The space gives off a high-tech feel thanks to numerous backlit panels, video walls and plexiglass panels, which allow for flexible storytelling and presentation formats. One of the flexible presentation options in Studio C. Images and renders courtesy of HD Studio. 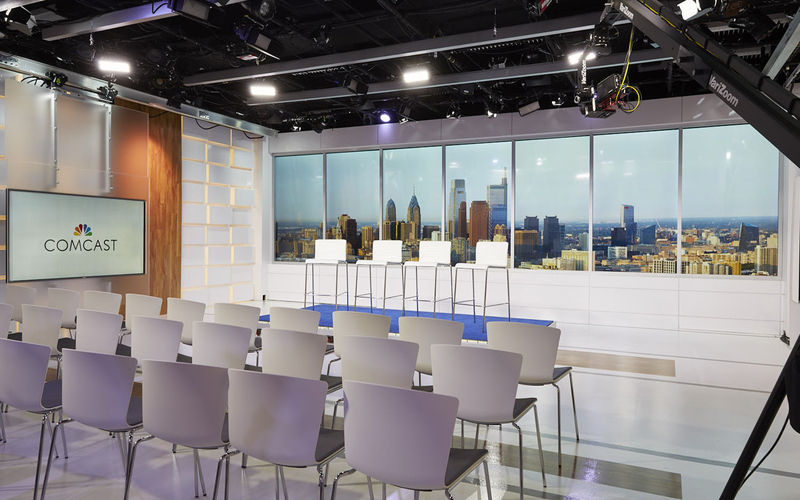 The primary backgrounds of the space are two walls of vertical video panels that can be used to display dramatic cityscapes of Philly, though branded and topical graphics are also among the possibilities. One of these walls runs almost floor to ceiling, while the other is a more traditional window height with a knee wall. Both “windows” feature risers and can be used in a variety of configurations, including stools for informal considerations that allow audience interaction, roundtable seating, or more traditional anchor-style desks. Rendering showing a town hall set up in Studio C.
Surrounding the studio’s other walls are a blend of sculptural, wood, frosted panels and tracking video displays. 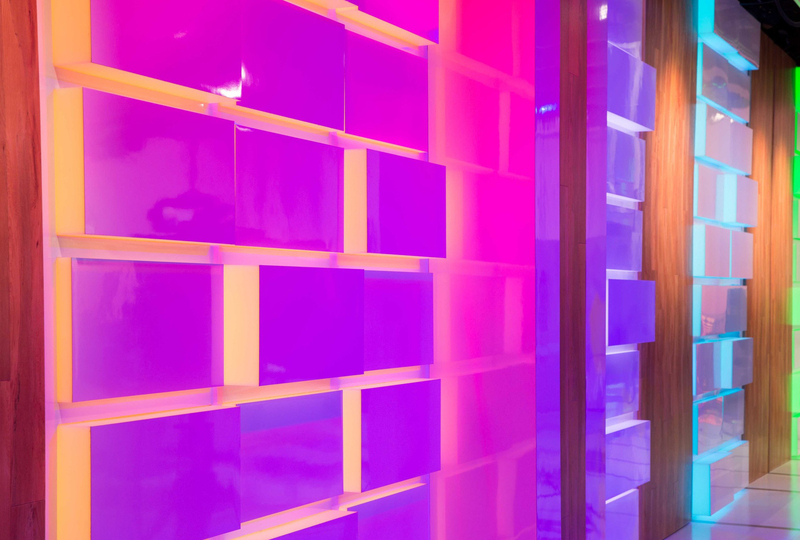 Integrating LED lighting in the dimensional white panels can give the space a new color scheme instantly thanks to lighting design from FLDA. 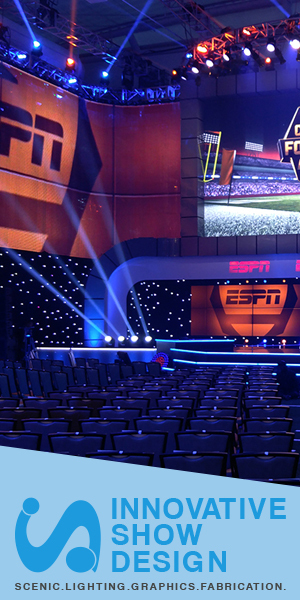 Rendering showing the tracking monitors separated in Studio C.
Additional tracking panels placed in front of the floor-to-ceiling video wall, meanwhile, can be arranged in a variety of configurations, including separately or in groups. This again allows for a variety of presentations. The space can accommodate a studio audience as well as both traditional cameras and mounted PTZ cameras. 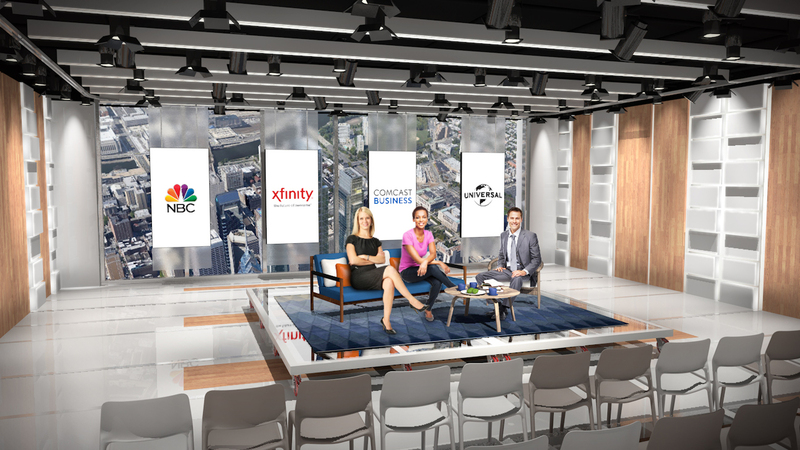 The updated Studio C comes as Comcast readies the Comcast Technology Center, which will house NBC’s WCAU and Telemundo 62. Correction: An earlier version of this story misidentified the location, size and type of project. 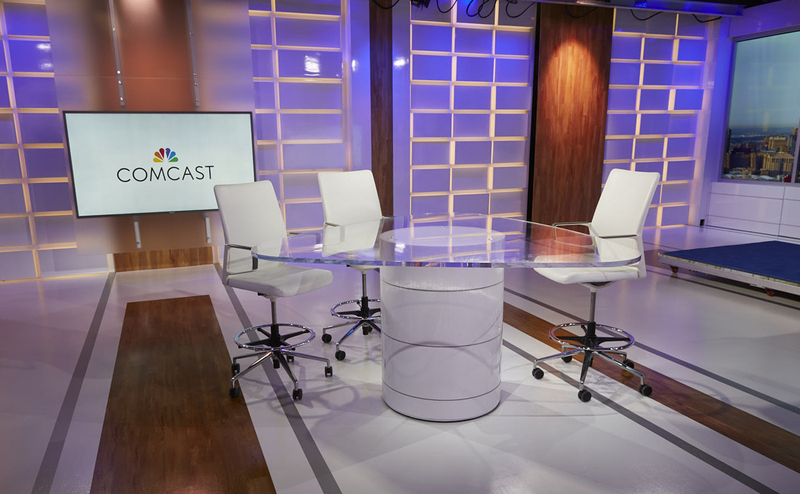 Studio C is located in the older Comcast Center and is approximately 2,200 square feet and is a refresh of an earlier version of the space.